Join our Community, Be the first of your friends. The difference between normal waiting list and CKWL is that when the normal waiting list moves up it goes to RAC category whereas CKWL means when the waiting list moves up you can expect confirmed berth. Example :RS7 51 means You are in RAC(Reservation against Cancellation) and Coach number S7 and Berth-51. Same berth will be alloted to two RAC passeners and they need to share it. Indian Railways provides free insurance to the passengers. In case of death railways pays Rs. 4 Lakhs and in case of injury the minimum amount is Rs. 32000/- and maximum can be Rs. 4 Lakhs depending upon the severity. On the accident spot railway pays ex-gratia amount Rs. 15000/- to the dependents of the dead passenger and Rs. 5000/- to the injured and Rs. 500/- less injured passengers for immediate needs. The insurance not only covers the travelling passenger, it covers the person who came to receive someone with valid platform ticket. If you have a valid platform or travel ticket and you get insured or dead because of any terror or due to railway negligence, you are covered under insurance. It is not just like your car insurance or motor vehicle insurance. Railway Claim Tribunal will decide the amount you are liable for insurance depends upon severity. railway pnr status questions and answers. Where can I find the PNR number ? How to get a PNR number? Where PNR Number is printed on an Train Ticket ? How can I find status of my train ticket through website, if details have changed ? I want to know my pnr status in railway reservation ? Pnr Status | irctc pnr status | Railway Pnr Status | Pnr Status Enquiry - i need best website all in one ? Answer is very simple if you have a look at the above train ticket. 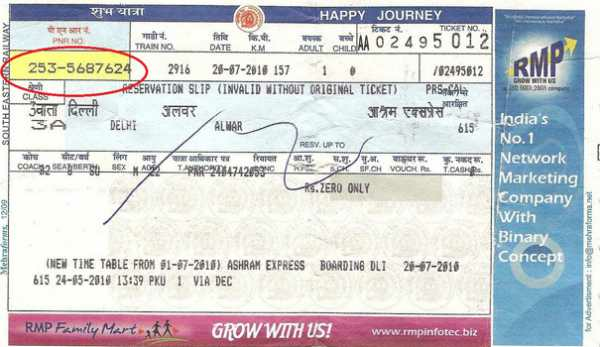 The red circled number is the PNR number which you can find it on top left conrner of your indian railways train ticket. Copy the same and visit http://www.pnrstatuscheck.in for updated PNR staus. It was on 27th Sept, 1999 that IRCTC or Indian Railways Catering and Tourism Corporation was incorporated but it was not until 3rd of August, 2002 that the operations began completely. It was created to perform the catering, tourism, and online ticketing operations for Indian Railways. PNR stands for Passenger Name Record. Note that this is not a construct of the Indian Railways. PNR is used in the travel departments all over the world. This is actually a record in the database of a computer reservation system that contains the details of a passenger or a group of passengers who are travelling together and chose to book their tickets together. This is a combination of letters or numbers and is used to uniquely identify a passenger travelling on board. However as far as Indian Railways are concerned the PNR is always a ten digit number used to identify passengers and their reservation status i.e PNR Status. How to find the PNR number? The PNR number is printed on the top left corner of the ticket if you have a printed, paper ticket with you. If you have booked your ticket online then look for a ten digit number on the screen, they should have the words “PNR number” written against them. How to check the PNR status? Once you have your PNR number, you can easily check your ticket status with it. Enter your PNR number and then hit enter to view the details of your journey and seat allotment. How to check PNR status through SMS? You can also check your PNR status with the help of your mobile phone using the SMS service. You can send them an SMS and you will almost immediately get an automated reply with the details of your seat. Some of the numbers you can send an SMS to along with the text you should type are described below. To give you an example of what I mean here, suppose your PNR number is 4523115127 and you wish to use the first method written above. And then send this message to 54959. Tatkal E-tickets can be booked one day in advance excluding the date of journey from the train originating station. It can be booked on the opening day from 10.00 AM onwards. e .g. if train is to depart from originating station on 2nd January, Tatkal Booking will Commence at 10.00 AM on 1st January. The provision for specifying ID proof at the time of booking a Tatkal e-ticket has been started from 21-11-2011. For booking Tatkal e-tickets, each of the passengers (mandatory for at least one passenger) can enter his/her ID proof type and number against his/her name in reservation form, which is to be used for travel. These details will be printed on the ERS/VRM as well as in the reservation chart. During the journey, at least one passenger, whose identity card number has been indicated on the ticket, will have to produce original proof of identity indicated on the ticket, failing which all the passengers booked on the ticket shall be treated as travelling without ticket and charged accordingly. Tatkal Booking facility provides Confirmed / Waitlisted tickets (for E-Tickets only) against Tatkal quota, in any class except 1 AC, for journey between source/remote stations having Tatkal Quota to destination. Tatkal I-Tickets cannot be booked. Only Tatkal E-Tickets can be booked. Maximum four passengers per PNR can be booked on Tatkal e-ticket. Tatkal charges per passenger in addition to normal ticket. The above charges will be levied uniformly both in peak period & non-peak periods. On Cancellation - No refund will be granted on cancellation of confirmed Tatkal tickets. For contingent cancellation & waitlisted Tatkal ticket cancellations, charges will be deducted as per existing Railway rules. Partial cancellation of Tatkal e-tickets is allowed but at least one passenger with ID card printed on ERS/VRM should not be cancelled. On cancellation of all the passengers whose ID card details is printed on ERS/VRM, all the passengers on that e-ticket will be cancelled. pnrstatuscheck.in is the best website for checking PNR Status.Join us by clicking on Like button, so that your friends can find the website easily. Be the first of your friends. del.icio.us! digg! reddit! technorati! yahoo!